Ryan Freedman first joined the Channel Islands National Marine Sanctuary's science team in March 2014 as a California Sea Grant Fellow on a one-year appointment. He has since stayed with the CINMS team through a contract with Cardinal Point Captains. His research background covers a wide range of topics; in particular he is interested in addressing coastal management concerns using a variety of spatial and quantitative techniques. He holds a Bachelor of Science degree from the Rosenstiel School of Marine and Atmospheric Science at the University of Miami where he double majored in Biology and Marine Science with minors in Chemistry and Geography. During his undergraduate career, he worked with various faculty members on several projects including mapping coral community decline, creating 3D maps of stromatolites, and modeling Manta Ray behavior off the mid-Atlantic coast. He had the opportunity to analyze spatial datasets for the Deepwater Horizon Oil spill while at NOAA's Southeast Fisheries Science Center. 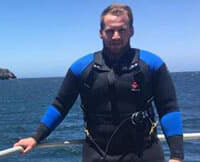 He also spent time with the Oceans Research group in South Africa, where he assisted in the tracking and data analysis of White Shark movements as an intern. In 2011, he joined the Shark Lab at California State University Long Beach, where his Master's degree work focused on analyzing movements of juvenile predatory fishes to assess the landscape connectivity, habitat use and effectiveness of restored estuaries. In 2013, he participated in the NOAA Recruiting, Training and Research (RTR) program’s resource dynamics workshop, helping to apply new population modeling techniques to the Gulf Sturgeon population and surveying regional stakeholder interests. He is currently (2018) a Candidate for a Ph.D. with the University of California, Santa Barbara where his research quantifies impacts to sanctuary resources. Ryan is enthusiastic about working alongside resource managers and scientists to address the needs of the sanctuary.